The Solana™ from the Dave Lennox Signature™ Collection takes a giant leap forward in clean wood-burning technology. In the wake of proposed legislation to restrict the sale of front-open wood-burning fireplaces, the EPA has drafted voluntary emissions standards. For more information on this EPA standard please go to EPA Burnwise. 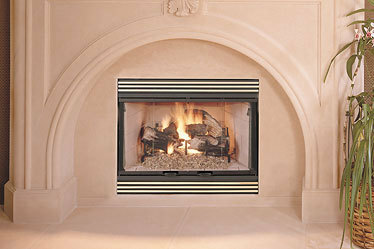 The Montecito™ wood-burning fireplace excels with outstandiing heat output and high-efficiency operation. The 2.0 cu. ft. firebox with 19” log capacity provides ample space for a dramatic fire within a firebox footprint that is ideal for a smaller space. The Montecito exudes classic beauty that transforms any room into an inviting gathering space. 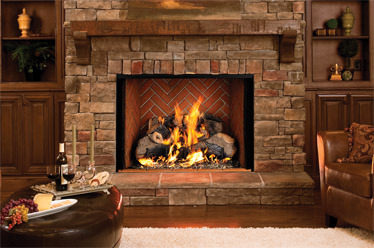 The presentation captures the treasured style of a large, traditional masonry fireplace with its finely crafted refractory and arch-design facade and door, available in a variety of options for a customized look. A family of premium wood-burning fireplaces with large viewing areas and features that provide a distinctive focal point in any room. If the clean, up-to-date appearance of stainless steel suits your style, and a wood-burning fireplace is in your plans, you’ve found your perfect match. 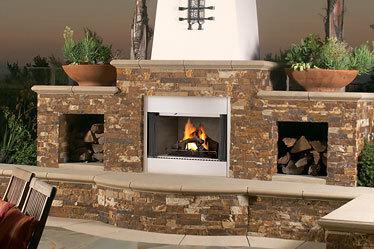 Designed for use either indoors or out, the Merit® Plus Series Indoor/Outdoor wood-burning fireplace is both beautiful and durable and comes gas-log-ready. The Merit® Series CPF-38 wood-burning fireplace allows you to create a dramatic focal point virtually anywhere in the home with its special three-sided peninsula design. The large 38” (front-view) firebox, with its sleek exterior and realistic lining, can be viewed from three rooms when installed in an island. Zero-clearance design uses cooling air to insulate the hot firebox for minimal clearance and simpler installation. The Merit® Series CST-38 wood-burning fireplace lets you see directly through the fire, creating a unique and picturesque room divider. 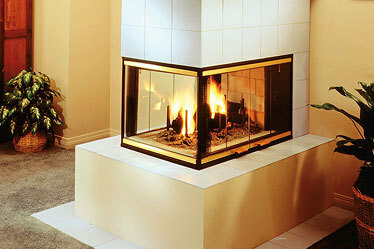 Installed in the center of a large open area, the 38” firebox allows a sizeable fire that adds warmth and beauty to any home. Its zero-clearance design, sleek exterior, natural-looking lining and selection of glass doors and panels allow you to add a designer touch anywhere. The Merit® Series HC wood-burning fireplace offers two large firebox configurations that feature reliable operation for a boost of warm air into the home. 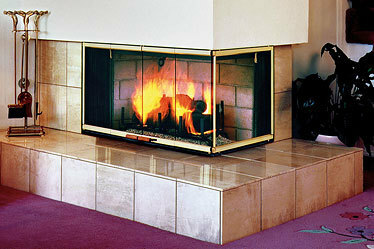 And with an optional blower kit, the HC fireplace can provide supplemental heat. The attractive design is complemented by standard black louver grills, which are available in a variety of optional finishes. Weekday: 10:00 a.m. to 6:00 p.m.